Every day, millions of animals are forced to exist in dark, filthy sheds, confined to barren concrete pens, wire cages, metal crates or atop caustic litter that burns their feet. Their world is one of unending pain and deprivation. Many undergo painful, unnecessary mutilations such as branding, castration, de-horning, and debeaking, a procedure akin to limb amputation, without anaesthetic or analgesics. When euthanasia programs do not exist or are not implemented, sick, diseased or injured animals are left to slowly die of starvation, as documented for example here with pigs and here with turkeys. When euthanasia programs do exist, they are frequently cruel and ineffective. 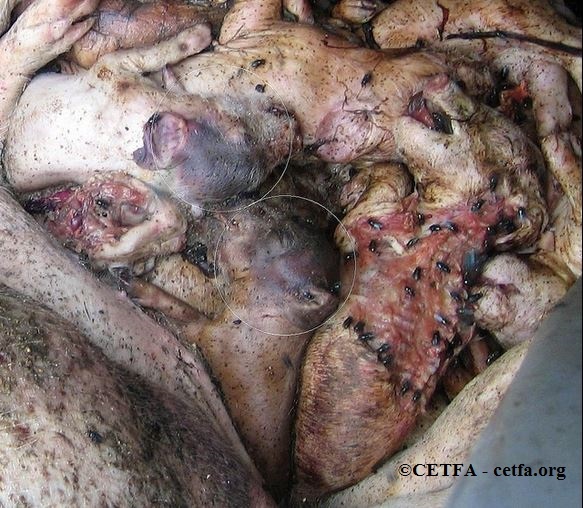 PAC’ing (Pounding Against Concrete; see photo below), for example, is used on newborn piglets but often the piglets do not die, and are thrown into bins still-struggling and suffering. These cruel standards of care exist because they are economically beneficial for industrial meat, egg and dairy producers who fulfill the demand for cheap food. A ban on confinement systems such as gestation crates for sows, battery cages for hens and crates for veal calves. A ban on cruel animal mutilations. The development of clear, on-farm regulations enforced by unannounced, routine third-party inspections. An end to factory farming. 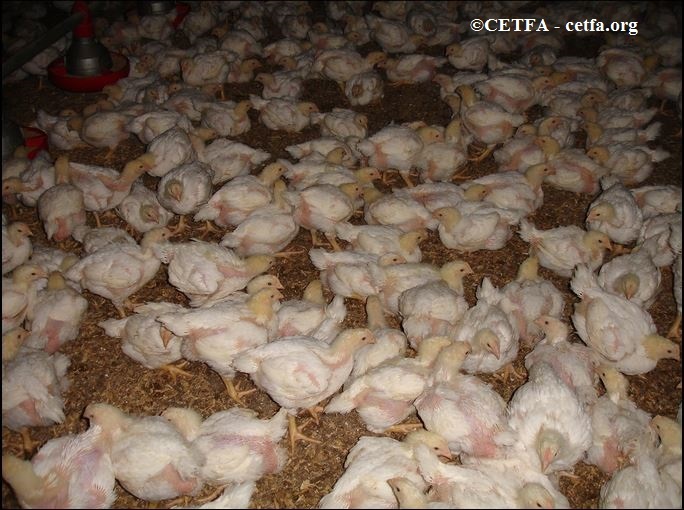 Broiler chicks in a Canadian factory farm. Bruised PAC’d piglets. CETFA was the first group to raise awareness about the practice of Pac’ing in Canada.